I gotta tell you, I've always had a thing for Bettie Page. I have been drawn to her image for many years and have been drawn to women like her (not all the time mind you - I don't have one particular type that I am drawn to - and now being married, I have one type...my wife). When I heard of her death today I paused. I am now familiar with her life more fully than ever before. Not just a pretty face and I am disappointed that I hadn't read about her life struggles before today. "She captured the imagination of a generation of men and women with her free spirit and unabashed sensuality," Roesler said. "She is the embodiment of beauty." To read more click here. Rest in peace, Betty. We love you. The Screaming Paisleys started out as Rhythm and Rhyme - a band thrown together for a Battle of the Bands contest at Sequoia High School. 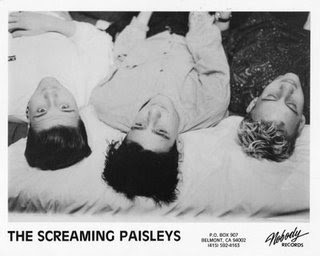 Soon after that "gig" we changed our name to The Screaming Paisleys, played for a little while and then broke up. At that point I began recording on my Tascam 4-track and I called my solo project mopehead. At a party at my buddy Scott Rehlaender's house Dave Ayer (The Screaming Paisleys' drummer) heard some of the tracks I had recorded and thought it would be cool to get together. We reenlisted Brent Willson (bass) and began practicing, but soon stopped playing together again. I started looking for a bass player to fill Brent's spot. One night while working at Gelb Music (click here to visit their website) Tony Iuppa saw the flier pinned to the wall and approached me asking if he could "try out" for the band. So Dave, Tony and I began practicing. The Screaming Paisleys were together again. Once we had a number of tunes ready we decided to record an LP. EXIT was recorded with Bart Thurber at the original House Of Faith (click here to visit website) recording studio (then in Bart's Palo Alto house). Bart was amazing and taught all of us a lot during the process. I had also been going to recording college so working with Bart was great to hone my production skills. EXIT was released in 1988. 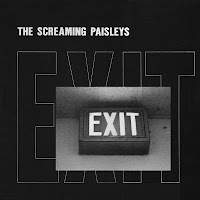 The Screaming Paisleys played lots of gigs. Our LP charted on many college radio stations nationwide. It was a good run. We ended up breaking up when Dave decided to go our tour with SAMIAM (one of many bands that Dave was playing in). Tony and I would get together and record strange songs on the 4-track, but the band would never get together again.Tony's friend, Shane created a website (click here to visit) for The Screaming Paisleys (a page for stuff that doesn't have a page).I've now ripped the entire LP onto my computer so I have a digital version of EXIT. If anyone is interested in the digital version, comment...if you'd like for me to post more tracks from EXIT, comment...how about just comment.As usual I plan to add more early Rain Station, mopehead and maybe Screaming Paisleys tracks in the coming months.